Phyl's Blog: A TUMMY EXACTLY 15 MINUTES BIG! A TUMMY EXACTLY 15 MINUTES BIG! My little Anna is funny. Some days she suckles on and off the breast all day, others she is more business-like. Daytime feeds can last less than a minute of hours of comfort but little milk. But during the night, I have noticed over the last few weeks, almost every feed starts around 4-20am and takes exactly 15 minutes - never 14 or 16, exactly 15 - sweet. 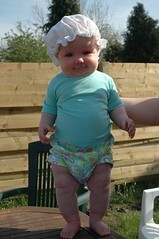 Oh, and don't you love what the breastmilk has done to her legs!? How come on a baby those legs are just gorgeous but on an adult woman the same legs would be considered hideous!? UK CHILDCARE - HOW IS IT SUPPOSED TO ADD UP? WHERE TO PUT THE KIDS?